As young boys growing up on the shores of New England, Jesse Burke and his friends would spend days exploring and sifting through the rocks and shells of the intertidal zonethe area of land that exists between the high and the low tide marks. In his photographs in Intertidal, Burke explores the complexity of masculine identity, which is in many ways analogous to the intertidal zone. His images capture those moments "in between," with the idealized notion of manhood on the one side and actually being male on the other. His photographs of men and their landscapes hint at sweetness, but they also embrace the heroic idea of masculinity. Burke is drawn to the tension of vulnerability (be it a rupture or physical / emotional / metaphorical wound) and grit ("no pain / no gain"); to the space between strength and tenderness. Sometimes these images capture the fleeting moment between events. Sometimes they capture the concrete event itself. Always, the photographs are working in the ambiguous space of the intertidal zone. 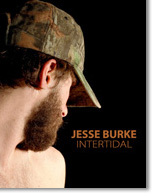 Jesse Burke was a recipient of a 2008 Rhode Island State Council on the Arts Aaron Siskind Fellowship. His photographs have been exhibited in solo shows and groups shows in Seattle, WA; Austin, TX; Portland, ME; Brooklyn, NY; and Boston, MA. His photographs have also been exhibited in Ottawa, Canada; Madrid, Spain; Stockholm, Sweden; Milan, Italy; and Tokyo, Japan.